Announcing my new report: “Plantations, poverty and power: Europe’s role in the expansion of the pulp industry in the South”. By Chris Lang. Published in WRM Bulletin 138, January 2009. Before the current global economic meltdown, the pulp industry had ambitious expansion plans. Although the industry was closing mills in the North, it was expanding dramatically in the South where about five million tons of new capacity was due to start up each year for the next five years. Vast areas of monoculture tree plantations have been established to feed raw material to huge new megamills, particularly in Latin America, southeast Asia and South Africa. Today, however, industry analysts are talking about overcapacity in terms of a “wall of pulp”. Between September and December 2008, global pulp production shrank by more than 2 million tonnes. Hardest hit is southeast Asia, where Asia Pulp and Paper and APRIL have reduced pulp production by a total of 580,000 tonnes. In Brazil, Aracruz is desperately trying to save money after losing about US$2 billion on investment in derivatives and has scrapped (for the time being, anyway) its proposed 1.5 million tons a year pulp mill at Guaiba in Rio Grande do Sul. Pulp mills do not build themselves any more than plantations plant themselves. One of the reasons for the industry’s current problems is a conflict of interest. European companies, aid agencies and institutions play a significant role in promoting and financing the expansion of the industry in the South. They promote this expansion not as a form of “development” but because it is beneficial to European industry. 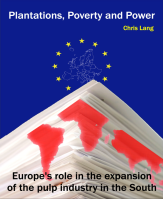 My new report, “Plantations, poverty and power“, looks at the role of European companies and institutions in promoting the expansion of the pulp and paper industry in the global South. 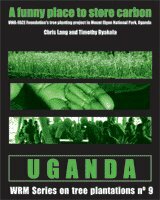 The report replies to the lies that plantation proponents repeat to justify the expansion of industrial tree plantations in the South: that plantations provide jobs, relieve pressure on forests, are only established on degraded land, restore soils, sequester carbon and help meet a “global demand” for paper. The biggest lie of all is that plantations are forests. The reality for people living in the areas where plantations have been established is that plantations have destroyed their livelihoods and sucked streams and rivers dry. The few jobs created are dangerous, poorly paid and often seasonal. Pulp mills are among the most polluting of industrial processes. Among the reasons that the South looks so attractive is that regulation is less strict. Trees grow faster in the tropics, labour is cheaper and governments provide a series of subsidies to encourage the expansion of the industry. 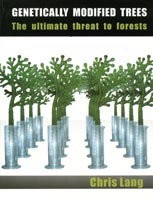 But another important reason, which the industry is more reluctant to acknowledge, is that in several countries, the area of industrial tree plantations expanded rapidly under brutal military dictatorships, when protest against the impacts of plantations was either extremely dangerous or impossible. Examples include South Africa, Chile, Brazil, Thailand and Indonesia. 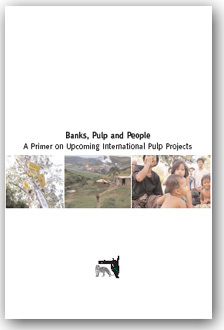 The report looks at five pulp projects in detail: Veracel (Brazil); Sappi (Swaziland); Advance Agro (Thailand); Asia Pulp and Paper (Indonesia); Botnia (Uruguay). Without generous subsidies it is unlikely that any of these projects would have gone ahead. The projects provided a series of lucrative contracts for European, Nordic and North American consulting firms, machinery companies, chemical suppliers and engineering firms. All of these projects have resulted in serious problems for local communities. This is followed by profiles of some of the European actors involved in promoting, designing and building pulp projects in the South. Pöyry is the largest forestry consulting firm in the world and has facilitated (and benefited from) the expansion of the pulp industry in many countries, both North and South. The Confederation of European Paper Industries supports the European pulp and paper industry regardless of its impacts on people and forests. The Asian Development Bank, the International Finance Corporation and the European Investment Bank provide examples of multilateral aid agency support to the pulp industry. Each of these aid agencies has different standards which it is supposed to apply to potentially destructive projects such as industrial tree plantations and the pulp industry. In each case, the standards (and the way in which the standards are applied) are inadequate to prevent the impacts on local communities and the environment. 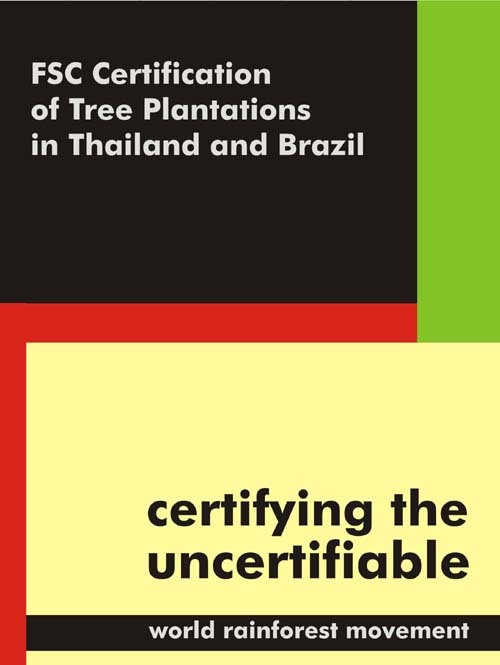 The report looks in detail at two sets of voluntary standards: the UN Food and Agriculture Organisation’s voluntary guidelines for “planted forests”, and the Forest Stewardship Council’s certification scheme. Both organisations support the pulp industry and the expansion of industrial tree plantations. By defining plantations as forests, the FAO helps create the illusion that plantations are not destructive, but simply another form of forest. FSC supports the pulp industry by certifying industrial tree plantations as well managed, failing in the process to address even the most egregious impacts of industrial tree plantations. The report concludes with a suggestion for an alternative way that the pulp industry could develop, which would provide the paper needed to meet local demand, based on small-scale pulp and paper mills using local raw materials. Paper could and should be produced without destroying forests, grasslands and local people’s livelihoods. A first step in moving towards a less destructive pulp and paper industry would be to stop the subsidies which help to keep the status quo. No more development funds should be used to facilitate the expansion of the global pulp industry and its associated industrial tree plantations. Brian Smith (2008) “Oversupply, downtime, fire sales — no happy holidays for reeling pulp industry“, RISI, 24 December 2008. “Worldwide pulp downtime topped 2 million tonnes in late 2008“, RISI, 8 January 2009. “Aracruz gambled away more than US$2 billion on derivatives“, PULP Inc, 6 January 2009. See, BioRegional MiniMills (UK), for more information about these “mini mills”. The mill in Uruguay is producing no pollution and Argentine journalists who visited Finland conformed that this kind of mill was not polluting the environment in Finland. Hi John – thanks for your comment. Actually, this article doesn’t say anything about pollution from the Botnia pulp mill. However, your comment that the Botnia pulp mill “is producing no pollution” is not true. All pulp mills produce pollution – whether this pollution is within regulatory limits, whether the regulatory limits are strict enough and what the impact of an accidental release of pollution might be are the important questions. My report notes that “The pollution from the [Botnia] pulp mill has received much attention internationally. Less discussed is the fact that the pulp mill sources its raw material from thousands of hectares of eucalyptus plantations, which are drying up streams and leaving communities without water supplies.” And my report looks in more detail at the impacts of these plantations on local communities and their environment. John: Botnia Fray Bentos (Uruguay) produce pollution, nobody can say a plant producing 1,100,000 tonnes (none of the subsidiaries of Finnish Botnia produces both) can not pollute. Last week, the nauseating smell of Botnia invaded the Argentine city of Gualeguaychú, yesterday showed a slick 10 kilometers in front of Botnia. Chris, your reports are very interesting, thanks. 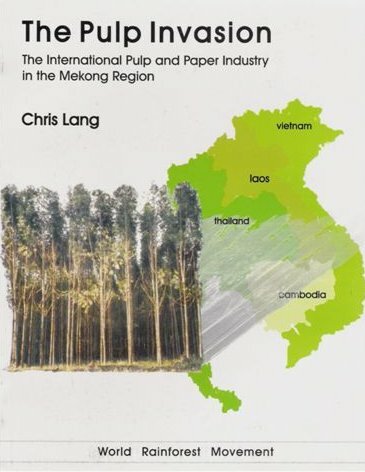 Hi Chris – thanks for your report and critical analysis of the pulp industry. I agree that paper should be produced without destroying forests, grasslands and local people’s livelihoods. You suggest to develop an alternative pulp industry to provide the paper needed to meet local demand. Do you mean that developing countries should not host tree plantations for pulp at all? Can the demand of paper in the west be satisfied by this alternative pulp industry? Where should these plantations be located and by whom? On the other hand, what alternatives do we leave for the smallholders in the South who want to generate sufficient income for their families? Thanks for this comment Alex. There’s a bit more information on my conclusions and recommendations in the report “Plantations, Poverty and Power” (available here). You ask four questions, which I think are good questions. But before answering them, I think it’s important to point out that I believe that solutions to the damage that the pulp and paper industry has caused and continues to cause can’t come from top-down solutions. The purpose of the report was to help facilitate a discussion about these problems and possible solutions. I don’t see it as my role to tell smallholders in Vietnam (say) what they should be doing with their land in order to fulfil someone else’s dream of a “sustainable” pulp and paper industry. Do you mean that developing countries should not host tree plantations for pulp at all? I think developing countries should make their own minds up about this. I also think that monocultures of industrial tree plantations have massive impacts on soils, the environment, and on local communities. Can the demand of paper in the west be satisfied by this alternative pulp industry? This question raises several other questions. For example, why is paper demand so much higher in “the west”? Does “the west” have the right to decide that vast areas of the Global South should be covered by monoculture to feed its demand? Rather than using demand as a justification for more monocultures, wouldn’t it be better to reduce demand? Paper demand in rich countries is very much higher than paper demand in the global South. There’s a discussion about paper demand in the report “Plantations, Poverty and Power” here. And an extreme example of the overconsumption of paper in the USA and a desperate need for paper in schools in Zambia, here. Where should these plantations be located and by whom? Local communities must have the right to decide whether they want their lands to be covered with monocultures of industrial tree plantations. I’ve visited several communities (in Brazil, Uruguay, Swaziland, South Africa, Laos, Cambodia, and Thailand) where the local community had no say about the plantations that surround their villages. On the other hand, what alternatives do we leave for the smallholders in the South who want to generate sufficient income for their families? By now I hope you realise that I am not recommending that all large scale pulp and paper operations are to be closed down tomorrow. And I’m not suggesting that smallholders should be forced to clearcut their trees and grow something “better” to make a living. I am suggesting that the current model of constant expansion of the global pulp and paper industry is not sustainable and is driven by a series of vested interests (more this here). I think it would be in all our interests for this to change. Exactly how it changes should be the result of lots of discussions at lots of different scales, in different places, and involving as many people as possible, rather than top-down “solutions”.